In the commercial Pudong area of this hustling, bustling, hot city, the first five-star hotel stands like a beacon of modernity reflecting the city's place as a capital of business. Superb Chinese influenced decor is the perfect complement to the wonderful array of up-to-the-minute facilities, highlighting China's successful attempts to blend the ancient world with the new millennium. 24 hour Fitness Suite; Gym, Health Club, Massage, Indoor Heated Pool, Sauna and Steam Room. Level 1, multi cuisine restaurant area serving an InterContinental buffet breakfast, lunch and dinner along with, a complete a la carte menu featuring Dishes from Europe, Asia and The Americas. Sushiman, freshly prepared sushi to dine in or take away. Red Chopsticks, nourishing and flavorsome noodles dishes, stylish setting with a tea bar, a selection of fine Chinese and herbal teas. Oriental House, serving the best of Chinese food from Cantonese, Shanghai, Chaozhou and Sichuan cuisine. Milan Coffee Bar / Bakers Oven, serves freshly grounded coffees and baked breads daily. I Bar, features a great selection of your favorite beverages and snacks and has a live band with a friendly atmosphere where you can unwind. Grand Hyatt Shanghai is the 'highest hotel in the world' located on the 53rd to 87th floors of the Jin Mao Tower. Located in the heart of Pudong, Shanghai's financial and business district, and with easy access to the Shanghai Stock Exchange, Shanghai World Financial Centre and the International Conference Centre. The hotel is only 50 minutes drive from Pudong Airport (PIA) and 30 minutes from Hongqiao International Airport (HIA). 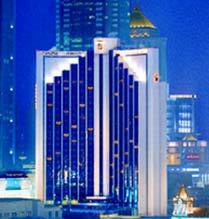 The 600-room Shanghai JC Mandarin is synonymous with modern comfort and convenience. Blending the best of the East and West, its service and facilities are among the finest in the city. Strategically located in the heart of Shanghai's prime shopping and business, easily accessible via highway and MRT, with bus stops and station only a short walk from the hotel. Located next to the hotel is the Shanghai Exhibition Centre. 600 guestrooms including 34 suites and 1 Presidential Suite whilst the Mandarin Club Floors and Lounge offer personalised butler service. The Hotel is currently under renovation of its public areas, restaurants and bars. This modernisation programme will progressively be completed by the second half of this year. Fitness enthusiasts will find a wealth of recreational facilities readily available in the hotel. The fitness centre offers a well-equipped gymnasium attended by trained instructors whilst experienced masseuses can provide a therapeutic massage. Also includes separate sauna and steam baths, as well as jacuzzi for men and women. Tennis and squash buffs can indulge in their favourite sports within the hotel, where appropriate equipment are available for rent. An indoor swimming pool makes it possible to tackle a few laps all year round. Mandarin Ballroom - The pillar-less grand ballroom covers 845 square metres and is elegantly designed and luxuriously fitted, from the plush carpeted floors to the glittering chandeliers. It can be divided into three self-contained sections, holding up to 1000 people in all. Meeting Rooms - Six stylish meeting rooms can each accommodate 20 to 40 people for cocktails. Two meeting rooms (located within the Business Centre). Crowne Plaza Shanghai is an upscale 4-star full service hotel, only minutes from the city's shopping area, strategically located within easy reach of the consulate and commercial districts and all main exhibitor venues in Shanghai. The hotel is known for its excellent service and friendly atmosphere, particularly geared to the needs and comfort of the corporate guests. Crowne Plaza Shanghai boasts 8 meeting rooms, including a ballroom, suitable for small to medium-sized meeting groups, ranging from 6 persons in boardroom style to 200 persons in theatre style. A team of Conference Service staff provides professional meeting and catering services, ensuring events go smoothly as planned. Half and Full-Day Meeting packages, rental of electronic equipment and high-speed Internet access in meeting rooms are available. The Business Centre is also located close to the meeting rooms. 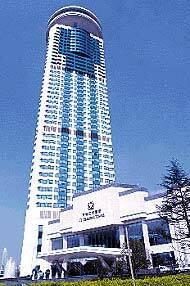 Located in exciting Pudong, Shanghai's eye-catching financial area, the hotel is close to Lujiazui business center. Easy access to Hongqiao and Pudong international airports. Close to Shanghai Scienceland. 549 rooms and suites. Various restaurants serving authentic Shanghainese and Cantonese specialities & western cuisine. The Tip Hat revolving restaurant offers stunning views of the city. Other facilities include bar, splendid Golden Hall for up to 400 people, fitness center, sauna, swimming pool & jacuzzi and beauty salon.